Every once in a while our merry monthly malt group breaks with our sacrosanct meeting approach to throw ‘open’ our doors to a sociable evening with better halves. As luck would have it – we managed a full house this month! The motivation for the evening was a delightful ‘score’ from a recent trip to Goa… With 4 lovely bright bottles of India’s Paul John single malts distilled in sunny Goa, how could we resist? While John Distilleries has been around in India since 1992, their first Paul John single malt was launched only in late 2012 in the UK. Now a few are available in India (Goa!) and it was a rare treat to try four expressions from the same distillery! We sampled in the above order – without reading the distillery tasting notes. Then my partner read out in his rich baritone the Paul John whisky descriptions… let’s just say they are unlike any notes we’ve seen! All are distilled in copper pot stills and while ‘NAS’ are understood to be matured for 4-5 years in ex-bourbon casks. As I keep being reminded, whiskies matured in warm… ok let’s admit it HOT climes (in the case of Goa) have an accelerated maturation cycle and heightened ‘angels share’ loss. However when done right in such conditions, the whisky sipper is the ultimate beneficiary! An immediate indicator of preference is the quantity consumed. After the initial pour, the bottles are available for further enjoyment. You can immediately see Classic was ‘tops’, followed by Peated then Brilliance. In fairness to Edited, we tried it earlier so a couple of late-comers skipped the sample. Clear stamp of being part of the same family – all had a luscious tropical feel yet varying degrees of bitterness on the palate proved none are wimps! Brilliance and Edited are like twins – one with blue eyes the other brown! Much speculation over whether the brilliant ‘gem-like’ colour could possibly natural!? It would be interesting to compare the Paul John expressions side-by-side with Amrut – such as their entry-level single malt or Peated. Based on our recent experience with Amrut, suspect Paul John would come out ahead. However a ‘blind’ head-to-head would still be an enlightening experiment! Particularly as within our group are a range of palate preferences. Regardless, how fabulous that India is now producing REAL single malts not just the mass-produced blended ‘whisky’ which is often coloured spirits masquerading as whisky. And we look forward to seeing what more is to come! The real test for me? I think a Paul John just might join an upcoming trip to Canada end June. My Aunt and Uncle have a whisky tasting club. They also quite enjoyed their time in Goa a few years ago…. So bringing a whisky taste of Goa to Canada sounds like a perfect gift! 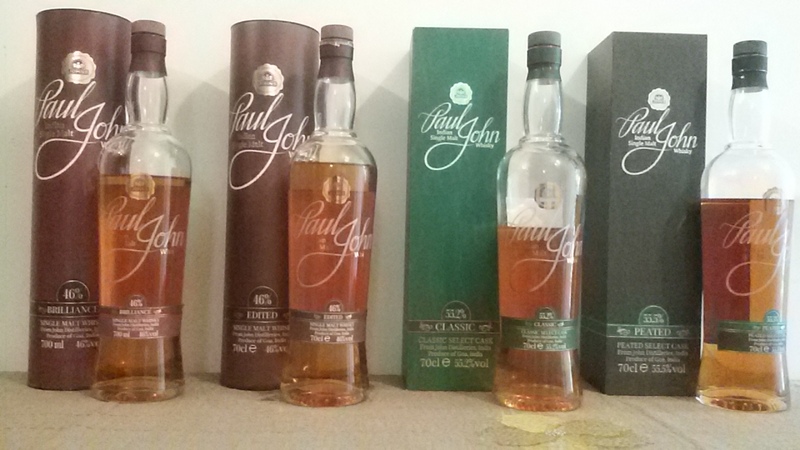 PS – Wanna see what the Whisky Ladies of Mumbai had to say about Paul John? It is no secret that I quite like some Japanese whiskies. But what about Taiwan? For years there were rumblings about Taiwan also doing something special. So you can imagine that when I had a work trip to Taipei years ago, I was terribly excited about the opportunity to snag something interesting. It proved slightly tricky. Why? I did find a couple of stores with a decent selection of whiskies from everywhere BUT Taiwan. I could only find Concertmaster plus small samples of other Kavalan expressions – naturally at a wallet-pinching ‘full-retail’ price! I grabbed the samples and risked catching Kavalan’s Soloist or other expressions at the duty-free. As luck would have it, after a few re-directions, I did find ONE little Taiwan whisky section with a rather bare range of Kavalan at the airport! Nope – no Soloist only Concertmaster that day. For those not aware, the Soloist range is the one garnering the special attention – including the Soloist expression Vinho Barrique recently receiving the 2015 World Whiskies ‘Best Single Malt’ Award! However Concertmaster also has a goodly number of awards to its credit too. So what about the Kavalan Concertmaster? 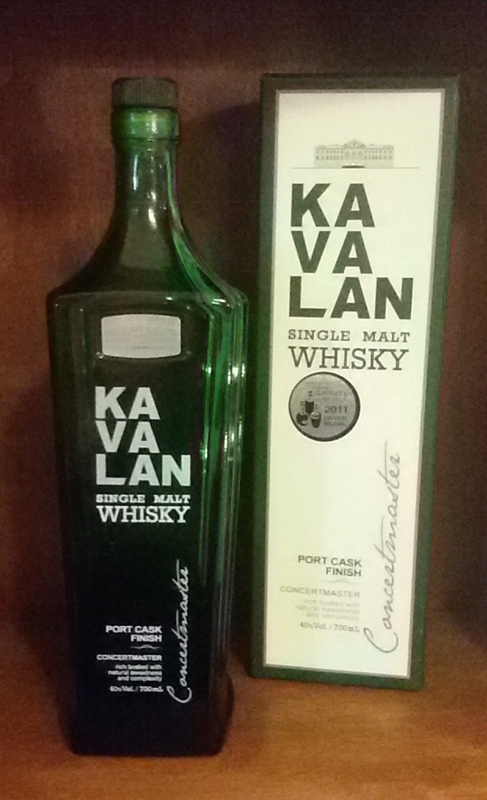 It is one of Kavalan’s entry-level single malt which is aged in American oak then finished in three port casks (Portuguese ruby, tawny and vintage) – hence the ‘concert’ of finishes. Now… here is where I must admit… when I first tried it, it was a disappointment. Especially after the excitement and effort… and certainly not for its price range. I’ve tried it a few times since and my overall conclusion is that while it is enjoyable and certainly worth trying at least once, it doesn’t seem quite balanced to my palate. Rather than a symphony of tastes, it is like the sweet violin strings are a little too discordantly brash without enough other instruments to bring depth and richness. This is like an unbalanced quartet masquerading as a symphony. 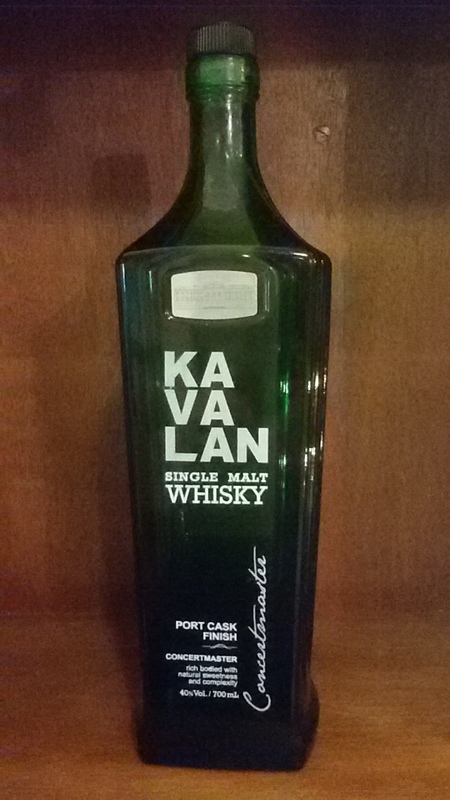 I honestly would have wondered what all the fuss was about with Kavalan had I not sampled from the Soloist range – much more interesting! So while I do not regret buying a bottle, it isn’t one that I will run out to acquire again! For the money, there are other many more options to explore. Australia is one of those countries that I kept expecting to get to… even had a plan once or twice and then something intervened. 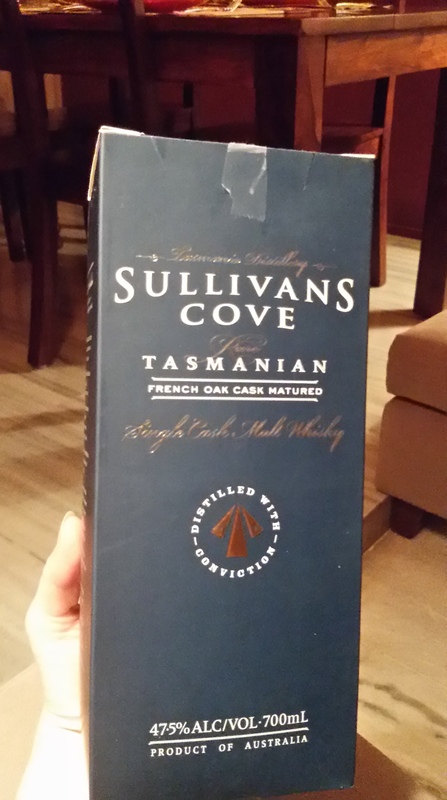 Knowing there wouldn’t be a trip anytime soon, when I first heard of Sullivans Cove, I did the next best thing – shamelessly ask for a bottle from Australia! In a rather round-about plan, I was hoping it could be brought by a project cohort who lives in Australia to Indonesia and then while there for a project, I would bring it back to India. Alas, thanks to the instant popularity of Sullivans Cove post Jim Murray‘s rave review, dreams of acquiring this dram were dashed when I discovered it was SOLD OUT at regular retail in Australia. Good thing another member had a full year earlier acquired it in Dubai! As a result, we were lucky enough to sample this whisky – go guys! 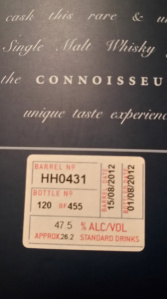 Speculation: Clear it has a slightly higher alcohol content, guessed around 47 – 48%. While must be a young whisky, had plenty of character. Pairing: Should be fabulous with chilli chocolate. Also aged cheddar and crackers. Water – Not interested in even trying! I jotted down these impressions without looking at our original experience… It was largely consistent with the 1st tasting and, once again, thought it an enjoyable dram. A remarkable find picked up by chance a year ago from Dubai duty-free. Now thanks to its award-winning status, near impossible to obtain. This Tasmanian treasure has no age declared yet clearly takes full advantage of the warmer climes speeding up the aging process in new French Oak barrels. A treat for the merry samplers! While I doubt will have a chance to sip Sullivans Cove again any time soon, it whetted my appetite to try other Tasmanian whiskies. The gents over at Whisky Waffle have a good Tasmanian Whisky list… so now… let’s see if I can cook up a convoluted plan to acquire one of the more promising sounding ones!! When Jim Murray was influencing us to guess an Islay when sampling blind the Amrut Peated, the closest I could think was perhaps an Ardbeg expression. 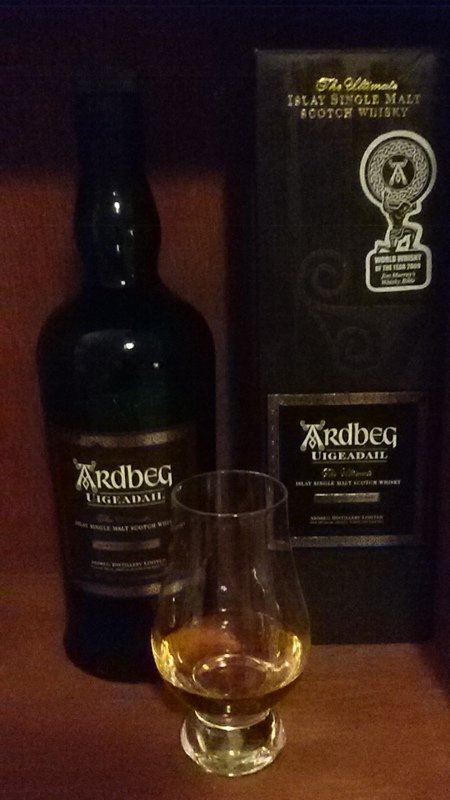 So when I found myself a few days later in slightly peaty mood, decided to go for a ‘real’ Ardbeg. 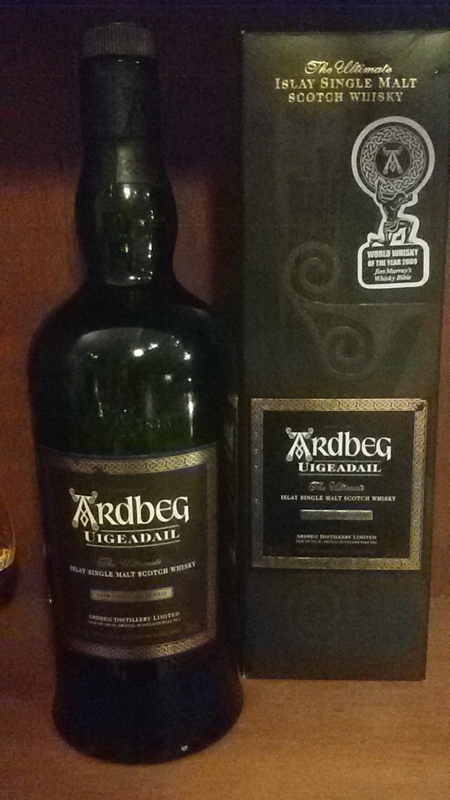 Of the Ardbeg stable, the Uigeadail has become a ‘classic’. A bottle of it also just happens to find its home in my cabinet… So why not revisit? Water – Cranks up the spice… then mellows out with the peaty smoke enveloping, chased by sherry sweetness. Doesn’t harm but doesn’t really enhance. Ice – I threw in a mini cube (gasp!) Not something I’m inclined to try with most whiskies – however we have now entered into the post Holi ‘warm’ season so decided to risk. And? Let’s just say it doesn’t do wonders for the nose however it brightened and lightened up the whisky. Can’t say it works for me. Maybe I’m just too stuck on the ‘no ice’ adage. What was my conclusion after the revisit? Well.. I can understand why Uigeadail has its fan club. It is also priced reasonably. What it pulls off best is bringing a chewy peatiness without clobbering you over the head with it. Personally, I prefer it best neat and it has been nice to have around for those times when the peaty mood strikes! While there are so many fabulous single malts out there, what about those sociable evenings where folks prefer quantity over quality? 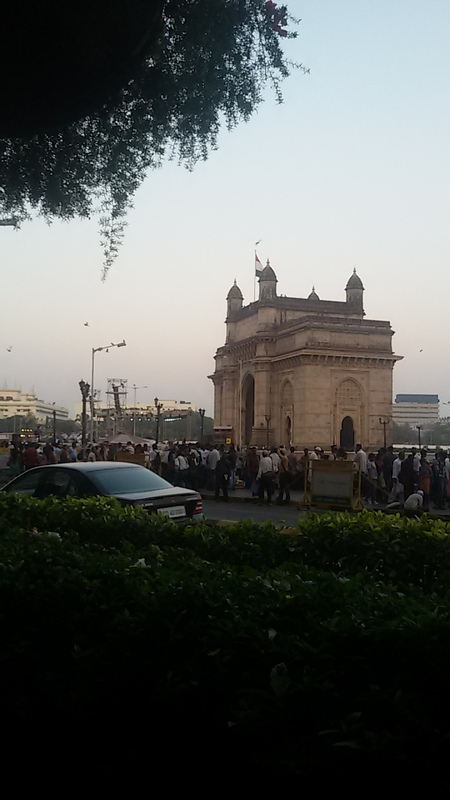 The usual suspects in Mumbai for around Rs 1,000 are Blender’s Pride, Antiquity Blue, etc. However one evening, supplies were dwindling and the local liquor store didn’t have any of these. That’s when my friendly neighbourhood ‘wine’ shop suggested MaQintosh. Thanks to Amrut‘s marketing efforts (with a nod to Jim Murray‘s Whisky Bible review), most would have heard of this Indian international contender in the single malt category. 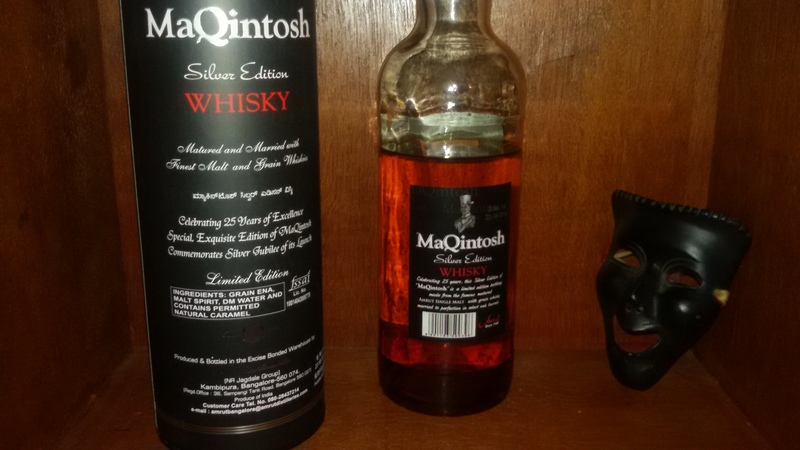 However few outside of India’s local booze shops would know of MaQintosh. Touted as a ‘Premium’ whisky, just what the heck? Well… it immediately comes across as fake Scottish with appalling spelling… I mean after all isn’t ‘u’ after ‘q’?? And tasting notes of the whisky? Yeah, I know… not exactly much, eh? But here is the deal… If you compare it with your average cheap – oops! I mean ‘premium‘ Indian whisky – it fares better. Far better. Me? I’m still on the quality over quantity side of the equation whereas party whisky should be the opposite. But that’s just slightly snobby me. Don’t let me stop you! We came, we sniffed, we spat and were decidedly NOT conquered! Over 150 folks showed up at Mumbai’s Taj Mahal Hotel Crystal Ballroom for a whisky tasting with whisky guru Jim Murray on 10 March 2015. The invitation card said to arrive at 7:15pm as the tasting would begin sharp at 7:30. The doors were tightly shut until the appointed hour as the staff poured out 6 samples of whiskies in tulip glasses for each attendee. Then the ‘show’ started. And it was a show… carefully curated to show off Amrut whiskies. Beginning with a tribute to Jamshedji Tata on his 175th Birth Anniversary, the Amrut founder took us through Amrut highlights over the last decade before introducing Jim Murray. After some crowd warming chit-chat, Jim began with lessons in how to nose through pointing out what NOT to do (push full snout into the glass), regaling us with tales and anecdotes while we warmed our glasses nestled next to our bodies. We were discouraged from discussing our impressions at the table, to reduce influencing each other, as part of the ‘lesson’ was to discover how the whisky ‘speaks individually.’ What this means is the notes that follow are the impressions of the two members of our whisky tasting club who jotted down our thoughts. I’ve kept the labels as per the place mat however notes in the tasting order. Experience – The first two were ‘revealed’ after we sampled both. We were challenged to identify which was Scottish vs Indian which lead to positively contrast the entry-level Amrut Single Malt against the mass produced entry-level Glenmorangie. While I’m not trying to defend Glenmorangie, I should note the sample was so small it could easily be misleading – the Amrut pour size was far more generous. While Jim extolled the virtues of Amrut vs Glenmorangie, neither were terribly noteworthy. Experience – Universally this was noted as ‘different’ than the others tried but not particularly good. Two lone souls identified it as a bourbon. Jim asked one if he was a bourbon fan – the retort was ‘No!’ (and turned out to be a distributor so at least he knows his business!). Experience – Jim was clearly trying to get us to guess this was an Islay and shared insight into the art (and follies) of adding peat to whiskies – so why not to an Indian whisky? Certainly no objection from this corner! Experience – Here is where Jim really got after the Scots for their laziness and neglect of their craft – justifying adding caramel vs what Jim would like to see – a ban on caramel! Also castigated Scottish distilleries in general for their methods of cleaning and re-using casks. Shared how Talisker may have been the 1st distillery he visited, however Indian distilleries are now taking much more care with the craft of making single malt. When Jim took a poll at the end of the evening, Amrut was preferred over non-Amrut whiskies, with more preferring the Peated than Fusion (though Fusion also had its fans). He also observed more women preferred the Peated than Fusion. Jim finished his part of the evening by sharing how he believes India has two outstanding distilleries – Amrut and Paul John – that are way ahead of anything else. 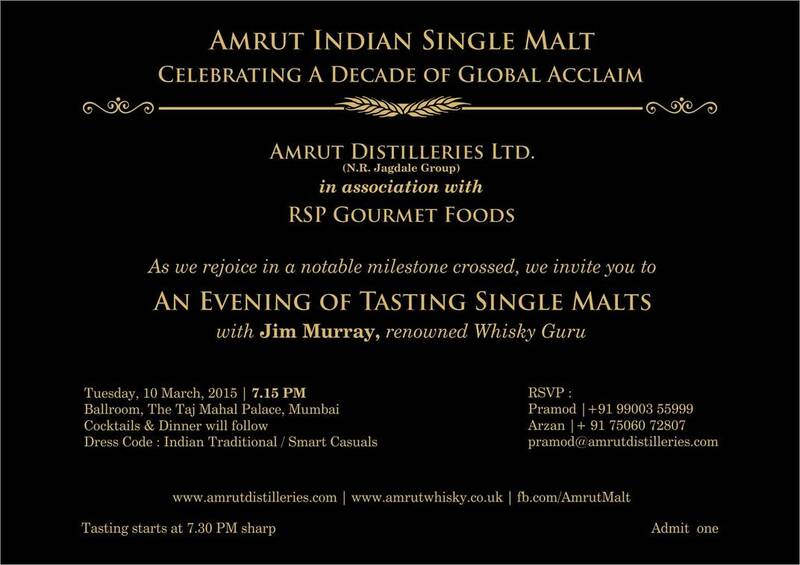 While I certainly applaud his recognition of the efforts of both Indian distilleries and appreciate Mr Murray is an expert genuinely devoted to the world of whisky, not sure the evening truly achieved either the stated objective of ‘education’ or unstated but understood aim of promoting Amrut. Jim Murray is certainly entertaining and his enthusiasm and love of whisky undisputed, however his slightly bombastic claim of rampant independence was belied by obviously steering the evening in one direction. And while he repeatedly said how he will keep Amrut ‘on their toes’ if he sees quality slip, the question really is – where does Amrut aspire to be? If it is truly wants to out-class Scottish whiskies yet with a distinctly Indian character, then why fear including at least one ‘aspirational’ whisky in the sampling to show what true quality single malt craftsmanship is about? Better question, if Amrut is producing cask strength whiskies, why not showcase at least one of those which may have proven more interesting? The only answer seems to be that clearly this event was targeted primarily at novices to whisky. For me, even the ‘best’ of the lot – Amrut Peated – didn’t stand the test when revisited later in the evening without being juxtaposed next to Jim Beam! 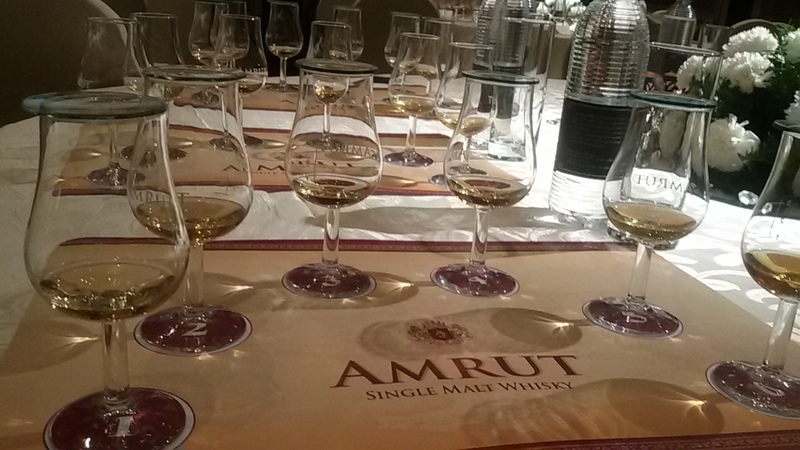 If anything, the evening did a disservice to Amrut, dumbing down what could have been a more interesting debate with a renowned authority on the world of whiskies and, more specifically, where one Indian distillery is forging ground. Not a complete waste of an evening but I for one was highly grateful to make copious use of the spittoon! While Whisky Lady was created to celebrate sampling whiskies, every once and a while I come across something that is just too exceptional – it deserves sharing even if it isn’t whisky! I should start by confessing, I’m generally not a tequila drinker. Shots aren’t my thing. Neither are margaritas, daiquiri, etc… To top it off, nights where tequila is involved have a tendency to end strangely. However on a trip through Singapore last year, I challenged the great guys at La Maison du Whisky to suggest something entirely different for our Mumbai whisky sampling gang. Out came this remarkable tequila… I had a few sips and could not resist! It was without a doubt, the real ‘googly’ of the evening for my whisky quaffing companions. All expected another whisky, so when I brought out for blind tasting an ‘extra anejo’ – tequila matured in bourbon barrels – palates were pre-calibrated to anticipate whisky. The colour could almost pass as whisky… naturally our resident expert caught on however I gave him ‘the look’ to not spill the beans and instead let others discover without influence. An exceptional tequila in a class of its own – 100% agave anejo from Carlos Camarena of the La Altena distillery using traditional production methods with brick ovens, wooden vats and copper stills. This extra anejo is aged for around four years – making it one of the oldest tequilas on the market. I pulled out a premium blue agave to compare – clearly proving just how different it is from its brethren! It really is something else and exactly the kind of tequila which appeals to whisky aficionados! I first shared this special find with our whisky tasting team on 14 June 2014 together with Tyrconnell, Ledaig 1997 and Talisker Dark Storm. 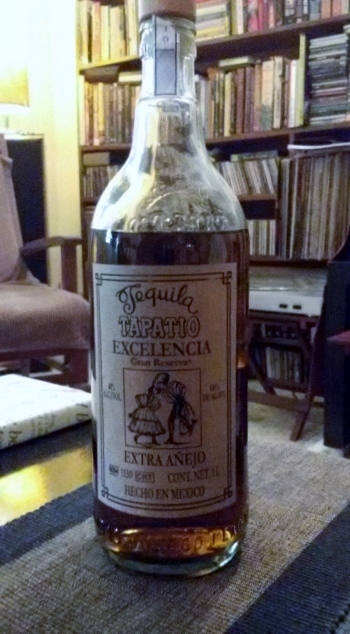 It occasionally gets pulled out again for the appreciation of a few extra special true tequila lovers… As I do not expect to source another bottle of this rare find… will continue to be stingy about sharing for as long as it lasts!